Time to start looking ahead, if you haven’t already begun to do so, to our next match in this year’s National Football League. It’s Kerry for us in this one, under the lights at at MacHale Park on Saturday evening (throw-in 7pm). I guess we’ll be naming our team as usual on Friday evening but ahead of that there are a few morsels of news about player availability to keep you going. First up, Colm Boyle. As Stephen Rochford confirmed in the post-match audio on the Mayo News football podcast, the Davitts man suffered a dead leg arising from that rather agricultural hit he got late on in the game in Clones. Stephen said then that it’d be a few days before they’d know for sure how Boyler is fixed for Saturday but he cautioned that “it’s very early in the season to be putting anyone out if they’re not proper and right.” I doubt somehow we’ll chance him for this one. Jason Doherty is another doubt. He didn’t line out the last day due to a muscle injury – the Western People on Monday said it was a problem with his calf, while the Mayo News yesterday reported it as hamstring trouble. The latter – in a piece by Edwin McGreal (paper and digital variants) – stated that Jason might, though, be okay to play this weekend and that Tom Parsons, back off his honeymoon, could be available for selection then too. On that basis, and given that Cillian O’Connor made an unexpected appearance off the bench last Sunday, I think we’re well set to field a strong team for this one. If Boyler isn’t okay to start then Michael Hall could slot in or, if Tom comes in at midfield, either Stephen Coen or Shane Nally could drop back (Stephen was, to all intents and purposes, centre-back last weekend). A more left-field option would be to tip one of the newbies – such as James Stretton or Shairoze Akram – in for their full League debut but I’d say we’re more likely to opt for greater experience for Saturday. In that vein, if Cillian and Jason Doc are both good to go then it’s hard to see why we wouldn’t start the both of them. Ditto Andy Moran – Shane Enright is still ploughing away at corner-back for Kerry and will, I’m sure, be gladdened at the sight of the Footballer of the Year trotting towards him once more with that big, sloppy grin on his face. One bit of hard news about Saturday’s game to finish up – the ref for it is Tipperary’s Derek O’Mahoney. The last time I recall him reffing a match of ours was when we played Kildare in the qualifiers the summer before last, on an evening when we had a few solid penalty shouts turned down, but sure we won’t hold that against him. Good stuff. Slowly taking shape. Avoid the serious knocks and we are good. Cillian back will be a big boost. If kerry play an inexperienced team then we should be taking the two points here, which would be brilliant heading to Salthill. Are Kerry missing as many this week as last? Derek O’Mahoney might have managed to get a good pair of glasses since then! Had a listen to one of the gaa podcasts (can’t remember which one) and had David Reidy, the Clare hurler who got man of the match the last day against Tipp. A very honest and in depth interview it was too. The thing that struck most was how he said that Clare are using the league to make Cusack park a fortress and get in the habit of winning there to be ready for the championship. They have two guatanteed home games and having those league wins at home, forms the basis of setting the expectations for the championship. It might seem straight forward enough but this is the type of thing Rochford should be drilling into the Mayo team ahead of the Kerry game. Last year, McHale park in the league was anything but a fortress. We’ll have Galway in May at McHale park and potentially another one or two home games with the super 8s on their way. Start the year unbeaten at home and continue that way for the year should be the motto. On the game itself – It will be interesting to see which Mayo full back line match up against that Kerry full forward line. That’s if all of the above start. Kerry’s tactic of pushing up on the Donegal kick out back fired badly. Think the conceded 2 goals from it. Rochford will be aware of this and can expect them to hold their positions and invite Clarke to kick long. This is where we need Parsons back badly. Also Boland needs to get back on the football pitch also. Need to build a squad of two keepers, 10 backs, 4 midfielders & 10 forwards come the summer. 6 games remain in the league to give players decent game time. I reckon in the last three years we have played 11 games at home in the league and our record is, won 4, drew 1 and lost 6. We beat Roscommon, Down, Monaghan and Donegal. Drew with Donegal. We lost to Dublin twice, Kerry, Monaghan, Tyrone and Cavan. Two of the games that we won were against teams that got relegated. So you reckon that we need to start beating the likes of Kerry and Dublin at home. Remember the last time we beat Dublin was 2012 when we hammered them in the league in Castlebar and then followed that up beating them in the summer in Croke Park. We did the same to Kerry last year, beat them in Tralee then beat them in a replay in Croke Park. So gaining a edge like that over a team should not be underestimated. Our home record in the League is cat. According to this week’s Mayo News we’ve only won 11 of the last 25 NFL games played at MacHale Park. Definitely major room for improvement there. Yes, the record is very bad at ‘fortress’ McHale Park. Kerry of course beat us in our last home game with them. On team selection it seems there are four stages: speculation – Rochy name checked Boyler on this one; announcement, with one or two changes from the previous game; actual line out, with anything up to three changes from the team already named. The fourth concerns the subs named on the programme: again, one or two changes there with the additional bonus of original jersey numbers being assigned to the replacements, further confusing fans and even journos. Willie Joe, we were certainly going to struggle to get a penalty, legit or otherwise of Ref Derek O Mahoney in the qualifier against Kildare.. Remember the controversy over the penalty Aiden was awarded the previous week against Fermanagh!… He might just give us a soft one to make up for all he missed that particular day on Saturday… I Jest! Yeah. Very poor home record in Mchale. Even the games we’ve won, we made heavy weather of some of them. A lot of it down to some shocking shooting and atrocious wides. Anyway lets hope there is an absolutely massive crowd there on Saturday night. Bringing the town to a complete gridlock, leading to a delayed kick off as thousands flock to Mchale park to acknowledge a group of men who were carried out of Croke Park on their shields last September for the second autumn running, after refusing to bend the knee to the great and the good. Think its important to persist with Regan this time of year when a lot of frees are given its important to have a good left footed free taker. Would prefer to see Nally and Coen reverse roles.Coens best position is 6 ,hes not great at going forward ,he plays well in a holding man marking role so he would better picking up Sean O’Shea and Shane Nally is a better fielder of the ball and better at going forward hitting longer accurate passes into the inside forwards. Honestly can’t say I share the concern about our home league record. If we are really honest about it, over the last 7 years, the league has never bore any resemblance to the championship. A hobby of mine from time to time here is going back over the results archive and reading the reports and comments from league games and then some championship. They are so wildly different it’s unreal. When I said last week that I would take 6th place on points difference I meant it! Our record at home, when it matter, in the Championship, makes for impressive reading. We have lost one game at home in the Championship in a decade. would like to see treacy get a run on Saturday? What will we learn playing Andy, Cillian etc in February? It is a little hard though not to be concerned about the pitch right now… Bloody hell some rain in Castlebar the last 2 days. Whats the alternative if McHale Park is not playable on Saturday night ? It will be playable RosTown, but it will be messy! I walked the pitch yesterday. Its in bad shape with humps and tufts all over the place. The goalmouths are covered in sand which will make goalkeeping a nightmare. A notable improvement for this year is the netting behind the goals has been updated to a nice Green & Red one, with white trim falling to the ground. Gone are the big signs for Coxs on the Ball Stop Net Posts. The place looks a little crisper but the pitch will be rough. I would have thought they sanded the pitch fairly heavily Highking. Is it fairly muddy? It’ll cut up fairly badly I’d say. After Saturday, it will have 3 weeks to recover for the Dublin match so hopefully we’ll get some dry weather and sunshine. There is no alternative to MacHale Park for Mayo league games nowadays because of the crowds attending. Some years ago, in the bad old days, there were several. Which makes playing the FBD games in MacHale Park crazy and unforgivable. Two matches in two days in horrendous early January weather! Who makes these decisions? Much is said about player welfare but the people who are sending out players in these conditions cannot even spell the words, much less understand them. And the GPA are silent too. I will be heading to MacHale on Saturday but will not be one bit surprised if, once again, the game is called off at the last minute. A big part of our issues in Castlebar is the heavy pitch. How much would it cost to do it up properly? By comparison to other county grounds it’s in bad nick! In dire need of proper repairs. Only so much the groundsmen can do with it. The pitch will be absolutely fine for the summer. It will be pristine and unrecognisable compared to now. Unfortunately, the reason the pitch is in the state it’s in right now is a mixture of sheer volume of games since October and an horrendous winter. Make no mistake, Croke Park would be the exact same if it weren’t for full time groundsmen and the highest quality equipment (if the same amount of games had been played on it). Andy D I think MacHale is the only floodlit pitch, so for any evening games, they have to be played there, which was the case with both the games played against Galway and Leitrim – admittedly the Galway game was originally meant to be the afternoon of a Sunday as opposed to a Friday evening. Weather won’t have helped much and its a case of playing a game on a Wednesday night in horrific conditions and then 2 nights later in similar won’t have done the pitch any good but it is what it is now. . Some comments on here are frightening me !! Is the pitch that bad that there could be an abandoned game on Saturday night and if so when are they likely to make that call. Mayo is a long haul from Kerry and there will be a lot of very pissed off and out of pocket Kerry supporters if they make that trip for nothing. 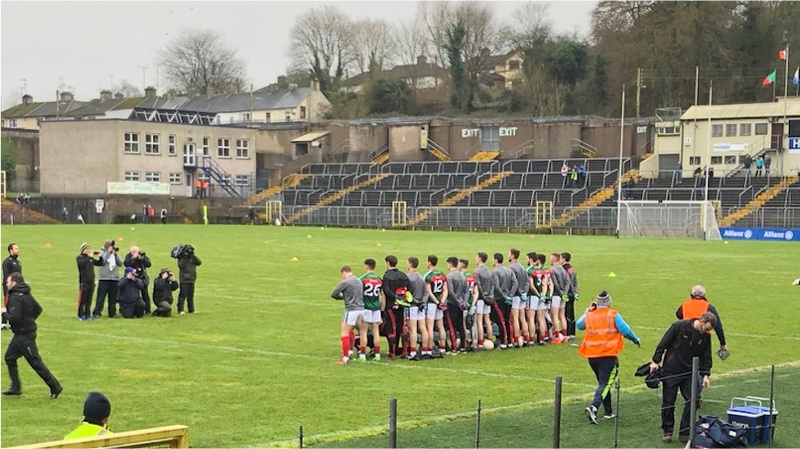 Fitzgerald stadium is in excellent shape at the moment and it has been a very heavy winter here as well, players were able to hop the ball last Sunday (even hop it twice !!! ) with ease. It’s hard to imagine who Fitzmaurice will go with the next day, we are very depleted with extended returns and injuries, the number is 20 players missing now that James O Donoghue tore a calf muscle after a few minutes of play last Sunday. Coupled with this glaring issue is the fact that almost all of our young guns are in Sigerson action this week and next, Jason Foley, Andrew Barry, Brian O Beaglaoich, Sean O Shea, Tom Leo O Sullivan and killian Spillane were out with UCC and won so will be at it again early next week. David Clifford and Gavin Crowley travelled to queens in Belfast on Monday night and played and won with Tralee IT yesterday and are out again next Tuesday. Brian O Seanacháin, Jack Barry and Barry O Sullivan are out with UCD and likely to win. Mathew Flaherty, Michael Byrns and Cormack Coffee are with Mary I. Ronan Shanahan with DIT. 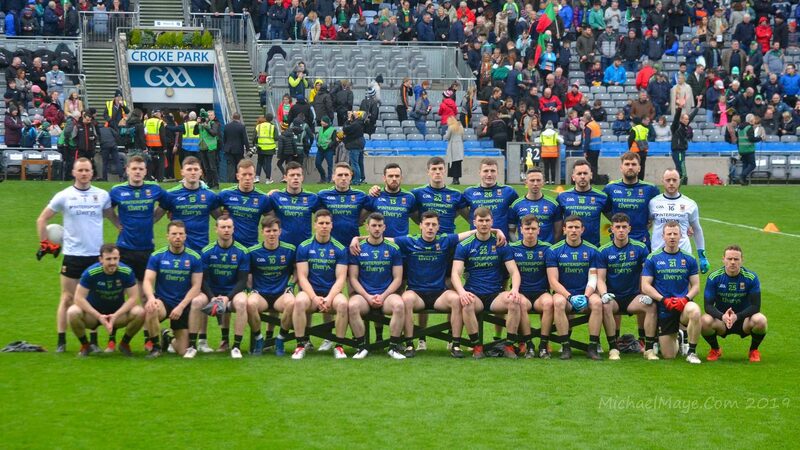 McHale Park will not be a pleasant place for Kerry me thinks on Saturday night with the difficulties the Kerry management have regarding absenteeism, injury and a travel and leg weary collection of kids who will be probably again thrown into the deep end against a very strong Mayo side. In saying that apart from our lack of a defensive structure Kerry played very fast and creative football last Sunday. To be fair to both teams it was a belter of a game with some wonderful scores on both sides, most notably from McBrearty who is simply a class act. I feel we could get a right trouncing this weekend if Andy is unfettered and allowed to dine on the open spaces between midfield and our fullbacks that were left unmarshalled by Kerry in last Sunday’s game and indeed in last years two semifinals as well. It’s a very difficult game to make a call on as from a Kerry perspective we simply don’t have a clue who is either available or capable at this point and time. I see some of the college team managers are putting pressure on EF to rest their players before next Tuesday already so it’s hard to see him throwing them in both his hands are very tied to be fair. Regarding McHale pitch, it was rarely an issue until this year due ro heavy rain and the amount of games played. It will be fine come championship but there will be a few messy games until then. Its not really relevant that it was the same contractor that worked on the Hyde and previously on McHale, its the specification required and what they were paid to do that really matters. The Hyde is a completely new sand based pitch including underground drainage system. McHale park wouldnt be up to the same specification. The cost of the Hyde Park pitch was in the region of 700,000. Mayo County Board are not going to throw that kind of cash on the pitch beacuse until this year there wasnt much hassle with the pitch. On another note, Highking, im delighted to hear that the Cox bar signs have finally been taken down. I have always wondered if those signs were the cause of some poor Mayo shooting the past few years, they must have been a distraction to a player, it was like kicking into ozzie rules goals. Conor Loftus scored a goal for DIT in their Sigerson win today. Danny Kirby didn’t play so must still be injured. No undersoil drainage at MacHale Park. A badly needed project if our winters continue to be this wet. There is underground drains in Mc Hale park but it needs to be mole drained due to its soil type–or preforibly changed to a sand based system–on a very dry summers you can clearly see the outline of the main drains. Jesus Game changer don’t worry about the pitch. Will ye be able to muster 15 lads together at all to play the game!!! Enjoy your trip to Mayo – it’s a lot shorter now with the new motorway from Gort to Tuam. Safe travelling to all Kerry supporters. Paddy Durcan and Shairoze Akram lined out in the half back line with captain Diarmuid O’Connor at left half foward for DCU in there win over Dundalk IT tonight. Does anyone know if Brian Reape, Michael Hall and Michael Plunkett are still attending DCU no sign of there names on panel. Shairoze really pushing for game time with Mayo now that he is lining out on a star-studded Sigerson cup team. Sexist, misogynistic and completely inappropriate !!! Cop on. BackdoorSam/Spectre – I’ve removed both of those comments of yours. This isn’t the place for that kind of ‘humour’. Gamechanger Jaysus we will be able to give ye a few of our lads to make up the numbers if ye are a bit lite. Bring plenty of kits, and water and we will have the rest. I do not buy this Kerry will be under strength bit. Not the Kerry we know. Expect a stern test Kerry are still the bench mark. This will be a clash of the top 3 teams in the country and it could go either way. Thanks McH..You took the words out of my mouth..
Reape needs to be makings an impression at this level before being though of a Mayo starter or even a match day panelist. Croke Park made €180,000 a day last year it seems. A lot of clubs had their insurance premiums double from €3,200 to €6,400 this year. Add in the €7,200 for the county board levy and the team registrations of €6,000. That’s €20,000 for a senior club in Mayo before a ball is kicked, a bus paid for, Physio costs, a jersey bought or a heaven forbid you”ve a managers expenses to cover. Isn’t it mighty how we constantly hear how much Aogán Ó Fearghaíl and Pairic Duffy care about the grass roots and that Sky’s money is making a difference at club level. Must be Dublin clubs they’re referring to…. very good point mayomessi. If those lads aren’t playing sigerson this season then they will struggle to make an impact at intercounty especially with a top 4 team. maybe they might be injured so we should all hold counsel until that is confirmed. Would like to see Loftus get 15/20 minutes on sat night.